Saturday’s Travers Stakes (gr. I) was not just about V.E. Day, but also V.J. Day. We had the Victory in Europe tie-in and the Victory for Jerkens tie-in. The Travers was also about family and the perpetuation of family history through the generations. Only in the Sport of Kings can images and memories reappear after a half century, untouched by time. It was in 1958 that a 29-year-old trainer made a name for himself by claiming a horse named Admiral Vee for $7,500 and winning major stakes with him, including the prestigious Saratoga Handicap. In many ways, it was Admiral Vee that launched the legendary career of Allen Jerkens. In 2014, the 85-year-old Jerkens was forced to miss the Saratoga meet for the first time in many decades, remaining in Florida to take care of his ailing wife, Liz, who passed away in early August. On Aug. 23, he watched from his home with his daughter Julie and her husband and Liz’s two sons as his son Jimmy, not only became only the second trainer in history to saddle the first- and second-place finishers of the historic Travers Stakes (gr. I), he did it from the same Barn 75 on the Oklahoma training track that his father was stabled in when he sent out Admiral Vee to win the Saratoga Handicap 56 years earlier. Perhaps that was one of the reasons the younger Jerkens stood on the track following V.E. Day’s Travers victory trying hard to restrain the trembling of his hands and the quaver in his voice. He was attempting to soak in the amazing feat he had just accomplished, while trying to cope with the heartbreaking nose defeat of his big horse from the Triple Crown trail, Jim Dandy Stakes (gr. II) winner Wicked Strong. It was the younger Jerkens’ second Travers victory, both by a nose, having narrowly won the 2010 edition with Afleet Express. There have been few Travers victories more popular than Jerkens’ one-two finish, as he put a new twist to his father’s reputation as “The Giant Killer.” Here, one of the giants he slew with his 19-1 shot was his own. One of the reasons this victory was so popular is that Jerkens in 2009 had his stable pretty much stripped clean when his main client, Edward Evans took away all his horses, including the brilliant Quality Road. Another of his longtime clients also removed their horses from Jerkens’ barn, leaving his stable depleted. Afleet Express' Travers score gave him a big lift, but that was followed by three lean years, during which he won a single listed stakes in 2011 and did not have a stakes winner in 2012 and 2013. No one can appreciate Jerkens’ struggle to get back to the top more than his wife Shirley, who is also his assistant and who gallops V.E. Day. Allen was happy that Jimmy has been able to accomplish something he never did – win the Travers. “I certainly had my chances,” he said. After last year’s Remsen Stakes (gr. II), all eyes in the Jerkens barn were on Centennial Farm’s Wicked Strong, who finished a strong third. The son of Hard Spun added the Wood Memorial (gr. I) and Jim Dandy and was fourth in the Kentucky Derby Presented by Yum! Brands (gr. I) and Belmont Stakes (gr. I). No one but Jerkens was aware that bubbling just under the surface was an up-and-comer named V.E. Day, owned by Magalen Ohrstrom Bryant. The son of English Channel – California Sunset, by Deputy Minister was late coming around after testing Jerkens’ patience as a 2-year-old. Jerkens, like everyone else, misses his father, especially at Saratoga, where “The Chief,” of course, scored perhaps his most memorable victory, upsetting Secretariat with Onion in the 1973 Whitney Handicap (gr. I). 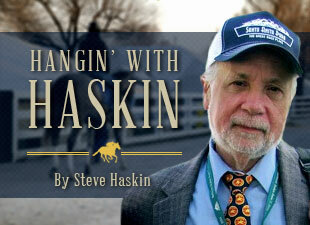 “Everybody misses him, not just me,” Jerkens said. “He’s been such a mainstay here for years and I'm glad I'm stabled over in Oklahoma because every time I go over to the main track side (where Allen had his horses for many years) I start thinking about him. Yesterday I got a little weepy watching that infield show (during the “Red Jacket” ceremony in the winner’s circle) and I had to go up to the microphone 30 seconds later and I could barely talk. V.E. Day, bred in Kentucky by Bluegrass Hall, broke his maiden on May 10 at Belmont, then followed that up with an allowance score on the grass before winning the 1 1/8-mile Curlin Stakes at Saratoga in a three-horse photo. In the Travers, V.E. Day saved ground in seventh under Javier Castellano, as Haskell Invitational (gr. I) winner Bayern set the pace, tracked closely by Belmont Stakes (gr. I) winner Tonalist and Wicked Strong. The three favorites remained in the same position most of the way through fractions of :23.74, :47.31, and 1:11.27. Wicked Strong put Bayern and Tonalist away, surging to the front and opening a 1 1/2-length lead at the eighth pole. The only horse closing was stablemate V.E. Day, who cut into Wicked Strong’s lead with every stride. V.E. Day kept coming and just got up at the wire to nose out Wicked Strong. It was another 2 1/2 lengths back to Tonalist in third, with Kid Cruz closing well to be fourth. The final time for the 1 1/4 miles was 2:02.93. No one knew much about Mrs. Bryant, who remained in a wheel chair and never said a word during the post-race press conference, as she was represented by her U.S. racing manager Cynthia Curtis, who did all the talking for her and who picked V.E. Day out of the Ocala Breeders Sales Company 2-year-olds in training sale for $135,000. But back in the Trustees Room, it was apparent why the 85-year-old Mrs. Bryant wasn’t speaking. As she sat and watched the replay, a constant stream of tears rolled down her cheek, and it never subsided the entire time she was there, even when she began talking about her own family’s history in the sport. Not only does Mrs. Bryant own V.E. Day, she also has a small piece of Wicked Strong. It was Mrs. Bryant’s family, her father George Ohrstrom Sr. and especially her brother George Ohrstrom Jr., who were involved heavily in racing, campaigning mainly in France, where her brother, who raced in the U.S. under the name Whitewood Stable, owned the top-class filly Comtesse de Loir, who was beaten a head by Allez France in the Prix de l’Arc de Triomphe (Fra-I) and a half-length by Snow Knight in the Canadian International (Gr. IT). Mrs. Bryant bred the 2-year-old French champion Pennecamp, who went on to win the 2,000 Guineas (Eng-I) before getting injured at Tattenham Corner in the Epsom Derby (Eng-I) and eventually becoming a fairly successful broodmare sire and sire of steeplechase horses. Mrs. Bryant, who is from Middleburg, Va., has continued to operate the family stable and has 120 horses in the U.S. and 150 in France. Mrs. Bryant says she wishes she could still ride, and appreciated Shirley Jerkens coming over and telling her that she galloped V.E. Day and described him as a “gentle giant.” Shirley then proceeded to visually describe exactly what it’s like galloping the colt. Mrs. Bryant owns a condominium in Deauville and goes there three or four times a year. Which brings us to the name V.E. Day, who got his name through his sire English Channel. Mrs. Bryant is a major supporter of the veterans and the organization Wounded Warriors. The following morning, it was business as usual at the Jerkens barn. Don Little Jr., president of Centennial Farms, was still attempting to deal with the tough defeat of Wicked Strong.